BiBimBap (비빔밥) is a healthy, filling Korean dish that many people love to eat. In Korean, it literally means “mixed rice” and that is exactly what you do. It is a scoop of rice served in a bowl with various vegetables and meat placed on top with a spicy sauce. When served, you thoroughly mix it and eat it with a spoon. There are many variations and each region in Korea has its own take on the dish. For instance, Jeonju (전주), an old, traditional city in the middle of South Korea is famous for it’s Jeonju BiBimBap. Dol-seot BiBimBap (돌솟 비빔밥) is served in a piping-hot stone bowl with a broth to help mix the rice. 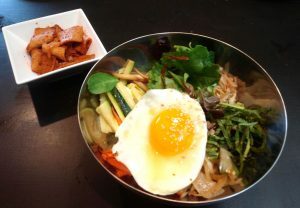 Bibimbap (비빔밥) – is a rice dish served with veggies and meat, a hot sauce and fried egg. Measure rice and place in a bowl or strainer. Rinse and add to rice cooker with water. Cook. In a bowl, add sliced meat, cooking wine, soy sauce, sesame oil and garlic. Set aside for 30 minutes to marinate. Heat a frying pan, add cooking oil. Stir fry the meat, keeping slices well separated. Set aside. In a small bowl, combine the Topping Sauce ingredients and mix well. In serving bowl, add scoop of rice. Place each stir-fried ingredient (steps 4 &5) on top of rice. Add a tablespoon of Topping Sauce. Place fried egg on top and add sesame seeds for garnish.